The carnival has packed up and is heading off into the sunset. The sounds of the midway are faint in the air. A slight breeze carries the scent of fried foods and roller coaster grease. You take a step forward, hoping to capture one last taste of the county fair and all that it has to offer. Instead, you find a sticky paper cone attached to the bottom of your sole; a piece of pink-stained detritus left over from the summer carnival. Lucky for you, you can take that crumpled tube of paper and breath new life into it with your very own cotton candy machine. 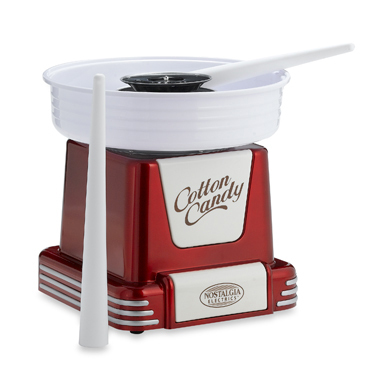 The Nostalgia Electrics Retro Series 50’s Style Cotton Candy Machine is a countertop appliance set to spin all year long. Just add sugar mixture and use the included reusable plastic cones to catch the freshly flossed cotton candy as it spins out of the machine. Now, that sticky and goopy mess that you thought you left out in the fairgrounds can finally be made at home. Lucky you.